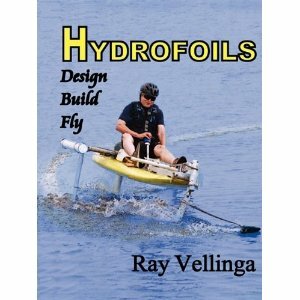 Hydrofoils: Design, Build, FlyThis is a book on how to design, build, and fly hydrofoil boats. It begins with the history and theory of hydrofoils, and continues with an explanation of flight characteristics, such as; stability, control, lift, drag, cavitation, and ventilation. Foil configurations, weight and balance, flying height, and roll management are covered as well as calculations of stress, hull configuration, and wing sizing. One section demonstrates methods for comparing designs, and explores specific design ideas for motorized, human powered, and sail powered hydrofoils. Piloting and trouble shooting are followed by a bibliography and index. This very complete book includes over 270 illustrations, charts and tables on the subject of creating hydrofoil boats. Because hydrofoils fly like airplanes, except in a denser fluid, the book’s subject could be described as aerodynamics adapted to hydrofoils. It is the best book available for hydrofoil enthusiasts. There is no other book like it.